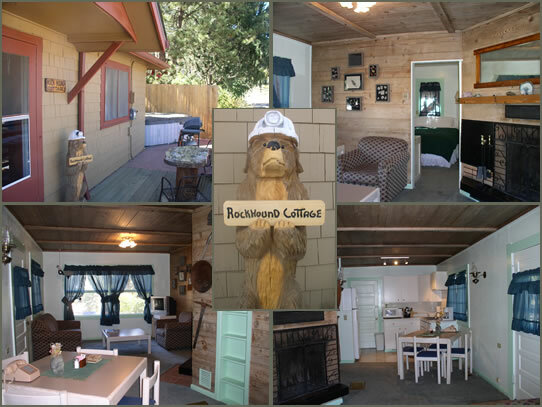 The Rockhound Cottage is a two bedroom cottage with one queen and one full bed, and a full sized sofa sleeper in the living room. One bathroom, a nice big kitchen and dining area, fireplace and a picture window that overlooks the lake and Gazebo. Private deck & hot tub. Fill your days with the many activities and attractions of the Pikes Peak region and spend your evenings in the clear mountain air of the Ute Pass communities. These communities at the gateway to Pikes Peak offer a host of daytime activities that will make your Colorado visit one to remember. Hike in deep pine forests accented by an artist's palette of mountain wildflowers. Test your angling skills for rainbow trout in the area's lakes and streams. Delightful dining can be enjoyed at a number of unique restaurants and you can kick up your heels to live entertainment - mountain style!